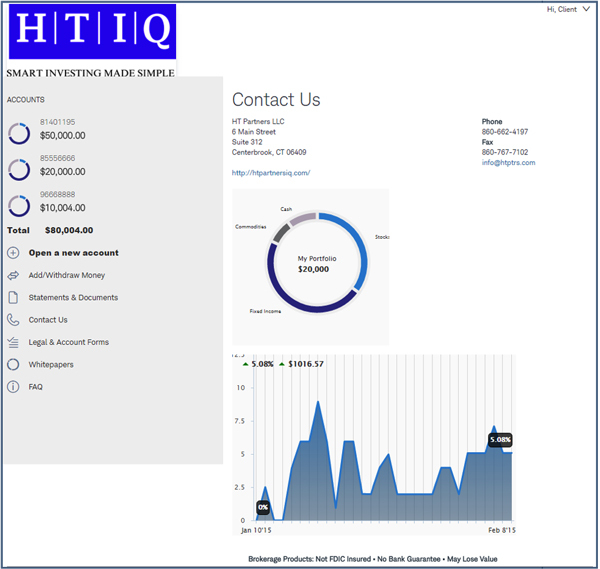 HTIQ’s portfolios typically consist of low-cost, tax-efficient indexed exchange-traded funds (ETFs) or exchange traded notes (ETNs). Upon deposit of funds, the account will be rebalanced into the strategic asset classes listed below based on your risk tolerance. It is the sole discretion of HT Partners LLC to determine which asset classes will be included or excluded at any given time. US Total Stock Market – The Fund’s goal is to track, as closely as possible before fees and expenses, the total return of the Dow Jones U.S. Broad Stock Market Index. International Developed Markets – The Fund seeks to track the performance of a benchmark index that measures the investment return of stocks issued by companies located in the major markets of Europe and the Pacific region. Emerging Markets – The Fund seeks to track the performance of a benchmark index that measures the investment return of stocks issued by companies located in emerging market countries. US Total Bond Market – The Fund seeks to track the performance of a broad, market-weighted bond index. Mortgage Backed Securities – The Fund seeks to track the performance of a market-weighted mortgage-backed securities index. Municipal Bonds – The Fund seeks to track the investment results of an index composed of investment-grade U.S. municipal bonds. International Bonds – The Fund seeks to track the performance of a benchmark index that measures the investment return of non-U.S. dollar-denominated, investment-grade bonds. Commodities & Natural Resources – The Fund seeks to provide exposure to various commodity and natural resource indexes via EFTs or ETNs. What Steps Should You Take When Making Important Financial Decisions?